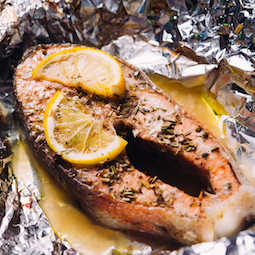 Here are a couple of barbecue salmon recipes for you - the one cooked in foil would be able to be baked in the oven if it should rain and the other one would go under your grill indoors. Salmon is a really meaty fish and barbecues well. The foil and marinade in the first recipe will prevent it from drying out. The second of the recipes will leave you with nice charred lines from the grill and brushing it with oil will keep it moist. The pepper and paprika will also char, giving it a nicer appearance. If you need to bake in the oven, then you will need to set it to 400f, 200C or Gas Mark 6. Cook steaks in foil for around 25 minutes, without for 20 and fillets for 15 to 20 minutes. Check for 'doneness' by poking it with your finger. If it's firm to the touch and looks ready to flake, then it's ready to eat. Mix the ingredients for the marinade and pour over the salmon - leave for about 30 minutes. Take four pieces of foil and brush with oil - on the shiny side. Place the salmon steaks in the middle, lay a slice or two of lemon and bring up the edges to make a dish. Pour the marinade equally between the parcels and then seal tightly. Place over the coals for about 20 minutes - open the parcel towards the end of the cooking time for the smoke to flavour the salmon. 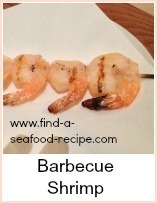 The second of the barbecued salmon recipes is much simpler as it doesn't require marinading in the same way. Using a couple of tablespoons of lemon juice, add salt, pepper, paprika and garlic salt to taste. Brush over the salmon steaks. Barbecue for about 6 - 8 minutes, basting frequently - turn and baste every 2 minutes or so. The salmon is cooked when it is firm to the touch - prod it with your finger, but be careful as it's hot! Two great methods of cooking salmon on the barbecue - one in foil parcels and one straight over the coals.